Story: Academy Award-winning director Hayao Miyazaki ("Spirited Away") takes moviegoers on an amazing new animated adventure that celebrates the power of love to transform and the resiliency of the human spirit in the face of adversity. 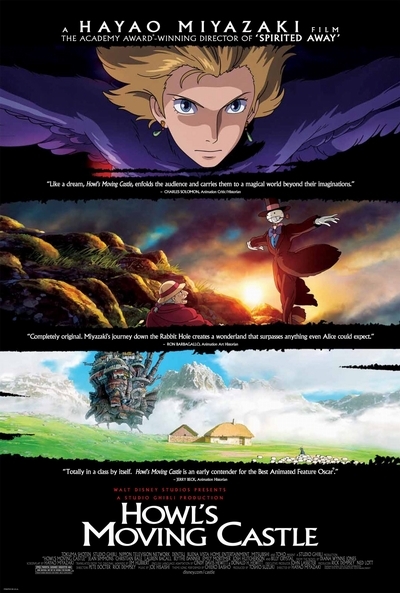 Brimming with a blend of imagination, humor, action, and romance, "Howl's Moving Castle" recently played to great acclaim at the 2004 Venice Film Festival, and has become one of the biggest blockbusters of all time in Japan - earning more than $193 million at the box office and still counting. Sophie, an average teenage girl working in a hat shop, finds her life thrown into turmoil when she is literally swept off her feet by a handsome-but-mysterious wizard named Howl, and is subsequently turned into a 90-year old woman by the vain and conniving Wicked Witch of the Waste. Embarking on an incredible odyssey to lift the curse, she finds refuge in Howl's magical moving castle where she becomes acquainted with Markl, Howl's apprentice, and a hot-headed fire demon named Calcifer. Sophie's love and support comes to have a major impact on Howl, who flies in the face of orders from the palace to become a pawn of war and instead risks his life to help bring peace to the kingdom. Extraordinary characters, inventive imagery, and stunning artistry make this latest masterpiece from the visionary Miyazaki an unforgettable filmgoing experience. There are two versions of this film currently screening in Australia. UniMovies will be presenting the original Japanese language version, with English subtitles.